Here in the Pacific Northwest, more specifically Vancouver Island, we are, at last, basking in the warmth of summer. We spend every possible minute outdoors - eating, lounging, working in the yard. Summers are so very short and we take advantage of any opportunity. 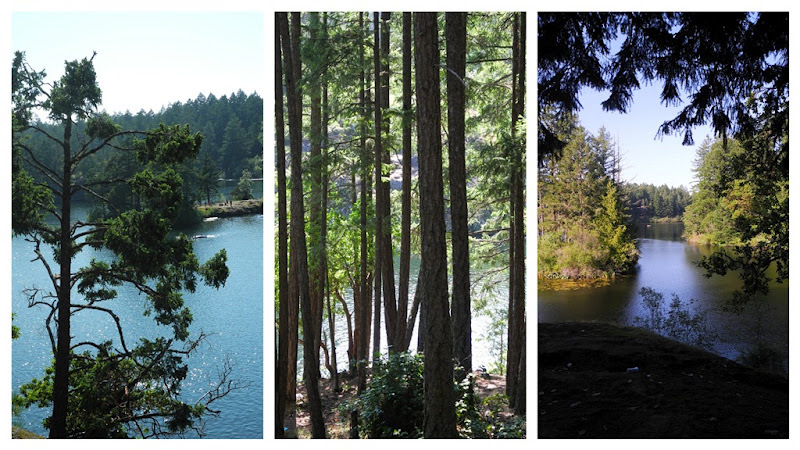 This afternoon Tim and I took a walk around Thetis Lake. There are two lakes, Upper and Lower, and a trail goes around them both. The lower lake has a couple of small beaches that were carpeted with sun-starved skin covered by skimpy bikinis and swim shorts. Further along the trail the crowds dissipated. Although the afternoon was warm, our walk under the canopy of trees was pleasant. Filtered sunlight patterned the pathway, and I thought of Gerard Manley Hopkins' line "Thank God for dappled things." The lakes meander through the forest where trees stand as sentinels on the shore. Occasional vistas open up on rocky bluffs. 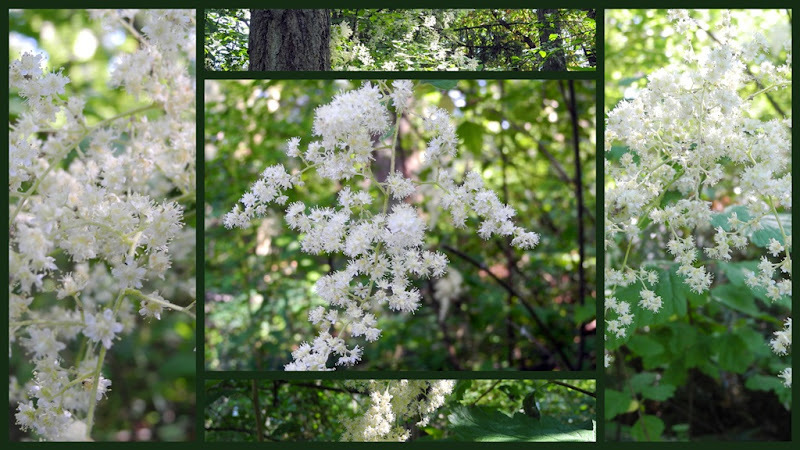 Oceanspray (Holodiscus-discolor) is in bloom. A native plant, also known as Creambush, it was used by the First Nations in a variety of ways. The wood is very hard and was used for arrows and small tools, including prongs for reaching into fire because it doesn't burn easily. The leaves and flowers were used as medicine. The common name comes from its similarity to frothy ocean waves. It grows everywhere in our forests, its delicate prettiness belying the challenging conditions in which it thrives. I'm hoping this beautiful weather lasts and lasts. The weather report shows cooling temperatures and no precipitation. I intend to savour every bit of summer I can. 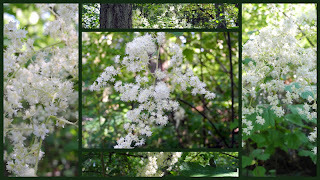 Dappled forest lanes and oceanspray flowers make a lovely mosaic, Lorrie. I think you may get some of the heat in your area we've been experiencing this week. Stay cool! Wasn't it beautiful today? The entire weekend was such a gift. Our Ocean Spray isn't yet blooming - we're just a little higher than Thetis - but I'm looking forward to those first blooms. How beautiful your woodland walk was - thanks for sharing it with us. We too had a wee taste of summer here in the SW of the UK after rain, rain and more rain when the sun came out and bathed everything in it's warmth and light. It's back to clouds today but it was enough to remind us that the sun is still there somewhere! Beautiful shots of the place. Very picturesque lake. lovely pictures...am enjoying the summer with you..
Lovely images, the forest and lakes are beautiful. Have a Happy day and week ahead. What a beautiful walk! Woods water flowers ... perfect! How is it that the weather here and there is so similar? We are enjoying such sweet days. No AC and high summer weather. Perfection wrapped up in 24 hours. Ahhh, dappled light. Love it. Have another wonderful day! Beautiful photos of you lovely walk Lorrie! It really has been lovely in our part of the world! Long may your summer reign - not rain! It is lovely when summer comes to the Island! Your photos have captured your summer love. I wish I have a cottage there. The place is beautiful it takes stress away for just a flick of the finger. Thanks for the visit I do appreciate it. Summer is fantastic in the Pacific Northwest. We just arrived in Oregon last week -- it is perfect here too. Your beautiful photos just give a feel of fresh air that I know you enjoy. I hope you do get to enjoy summer awhile longer; I know you have a short season. Beautiful photos...of a beautiful place...on a wonderful sunny summer Sunday! So glad your summer is back - may it live long! Your photos are lovely and remind me of the one time three of our family camped on Vancouver Island, by a different lake. It was so strange to us to have all the trees and a lake and yet be close to sea level - and warm! Normally to get that quality of scenery and beauty we have to drive hours into the mountains. With these splendid images and the way you describe the beauty of this place where you are so blessed to live, your could be a travel agent for your area. I would so love to visit this area, and yet who knows. In the meantime, just beautiful!! !